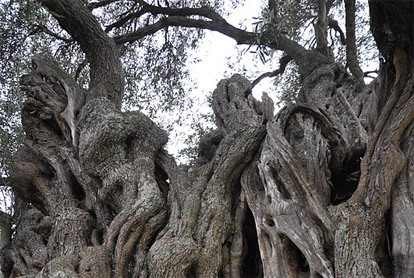 A beautiful park of centuries-old olive trees near Villamassargia (Sulcis, southern Sardinia) called S'Ortu Mannu and declared a Natural Monument. Here in all its splendor "Sa Reina", the largest and most beautiful tree of this garden: the base has a perimeter of more than15 meters, and a millennial age. 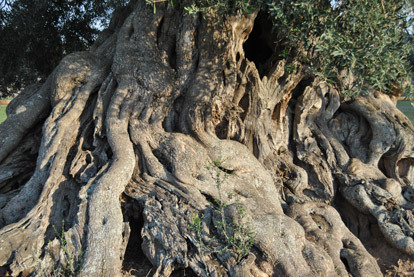 The trunks of the olive trees are each a beautiful natural sculpture: small or large cracks, contortions, twirls, twists, curls look like the signs that life has left on the character of every human person. The park is common, but the usufruct of individual plants remained the old families that once owned the land: each plant has a number plate, which refers to the family by the right of olive harvest. Each family is responsible for the care of the plant in usufruct. 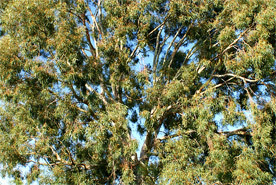 Eucalyptus (Eucalyptus camaldulensis). 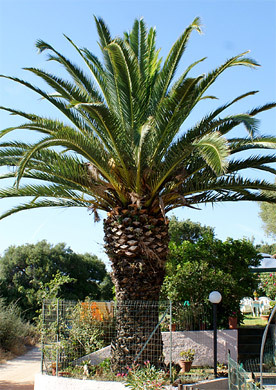 You'll find it everywhere in Sardinia along the rivers and along the shore of the sea; in fact strengthen the quality of the land on which it grows. It can reach a height of 25/30 m. is often met in woods and thickets, able to create large areas of shadow. 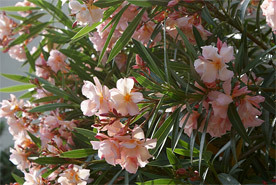 Oleander (Nerium oleander). It will accompany you along all the roads. Its bloom is very long-lasting, from May to October, and is presented with flowers of many colors, white, pink, salmon, red, purple. It 'a great decoration for every garden. 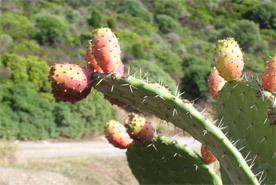 Prickly pear (Opuntia ficus-indica). 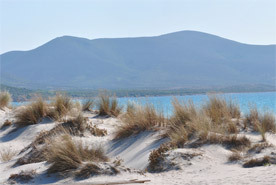 You'll find it everywhere in the south of Sardinia. 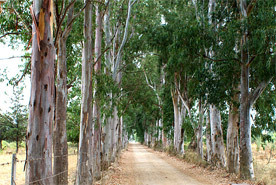 It is often used for the separation of two properties, often lining the road, or a fence or a stone wall. 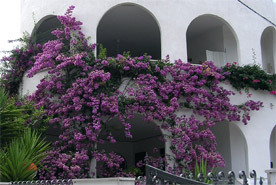 Bougainvillea (Bougainvillea glabra). 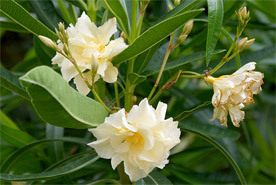 It 'a climbing plant of Brazilian origin that has adapted very well to the climate of the Mediterranean. To give its beautiful colorings are not the flowers (which are insignificant), but the colorful leaves surrounding the flowers. 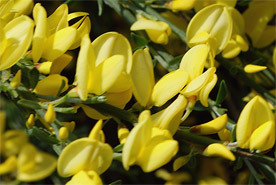 Broom (Cytisus praecox 'Allgold). 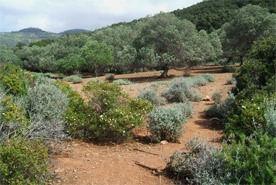 Flowering occurs from April to May, and is widespread on the hills to the Mediterranean scrub. We thank very much the site verdiincontri.com, which has authorized the use of the valuable pictures. Canaries Palm and China Palm (Phoenix canariensis and Trachycarpus fortunei). 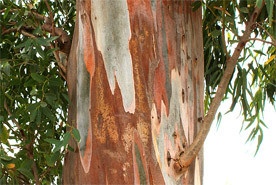 Are widespread in the Mediterranean and subtropical regions around the world for ornamental purposes, being suitable for decorating parks, gardens, avenues and squares. 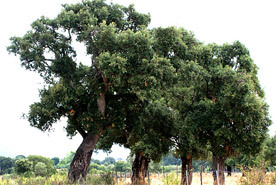 Holm Oak (Quercus Ilex). 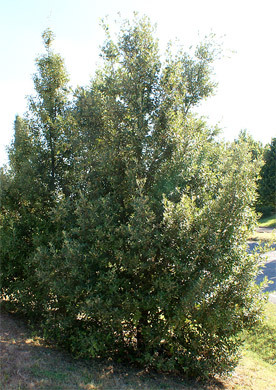 It’s an oak arboreal evergreen, but often comes in the form of a shrub. It has a very durable wood. 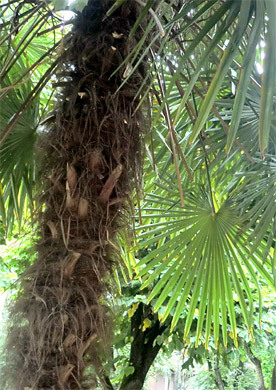 It’s a long-lived plant, can live up to almost a thousand years. 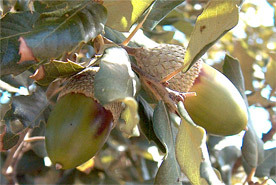 Cork Oak (Quercus suber). It 'a plant native to the Western part of the Mediterranean Basin, Spain and Portugal. 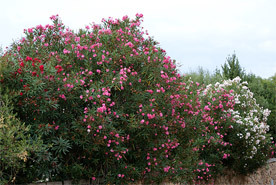 It’s widespread in Sardinia, Sicily and Tuscany Maremma. 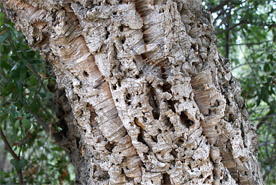 It is used commercially for the production of cork. 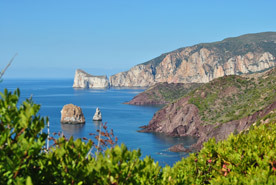 as well all tourist attractions of the South West of Sardinia.